Hello again everyone, Jennifer here once again. Hope you are all having a good day. 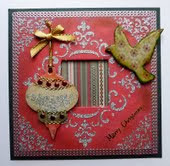 The card I have for you today I made for Sue and Harvey in November 2012 ready for the January 2013 QVC show. This time I thought I would use some alcohol inks which have been tucked away in my craft draw and haven't seen the light of day for some time lols ! OK let's make a start. The base card was made from white card and onto this I matted a piece of cerise shiny card, then some silver onto the cerise card, each time leaving narrow borders showing. I took a piece of the shiny silver card cut slightly smaller than the silver and coloured it with the alcohol inks and the blender until I was happy with the results. I then put the ivy stencil on top and spread the Sparkle Medium over the stencil. When it was dry I matted this onto the base card. 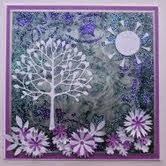 Die-cut and punch out tree and flowers using white paper and cerise card. Punch out a circle from white paper and glue to the top right for the sun. Surround the sun with white paper rays left over after punching out the cornflowers. There we are, card finished. 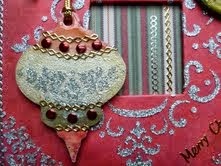 This is a very quick and easy card to make, especially if you do not have a great deal of time. Hope you are all having a good week despite the dull, dreary weather. I'm getting quite a bit of fabby crafting time just now as I cannot do any gardening - too wet !! whoopee ! just love to get in my craft room lols. Well today's little offering is not actually a card. It is one of Imagination Craft's MDF Charm kits, which I love working with as you can let your imagination (excuse the pun lols !) run wild and do just what you fancy, there are no set rules to what you can do! I have used the front frame only from the set (the other parts can be used for another project, so you get two items for the price of one !) which can't be bad lols. I covered this with red paper and rubbed some Forest Moss Distress Ink around the edges. I then spread Silver Gilt' Sparkle Medium onto it through the Fleur-de-lis Stencil. A piece of green striped paper was put behind the aperture and the MDF board was glued to a piece of dark green card. I added the silver peel-off border around the edges and two smaller pieces of gold peel-offs on the striped paper. I also added a gold Merry Christmas to the bottom right corner. Peel-offs are not something I use very often but in this case they are perfect for the job in hand. The dove I covered with patterned paper and rubbed distress ink on the edges, then covered with Magi-Glaze. A gold cord and ribbon were attached to the bauble. The dove and the bauble were then glued to the frame, the bauble left free to swing, attached only, at the top. Well that's it folks, hope you like it. You could add a ribbon hanger and have it as a Christmas decoration ! 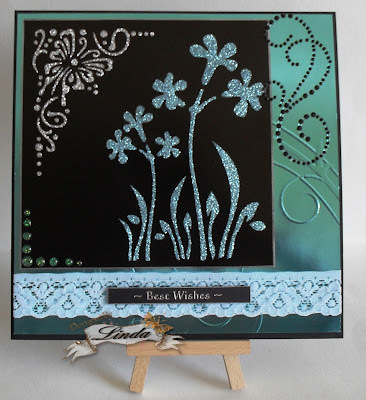 Today I would like to share a card I made using Imagination Crafts Petal Flourish Stencil with Sparkle Medium in Silver and Blue Sapphire which you can purchase here. 1. 8 x 8 square black card which I have matted and layered blue embossed mirri card with blue lace wrapped around the bottom. 2. 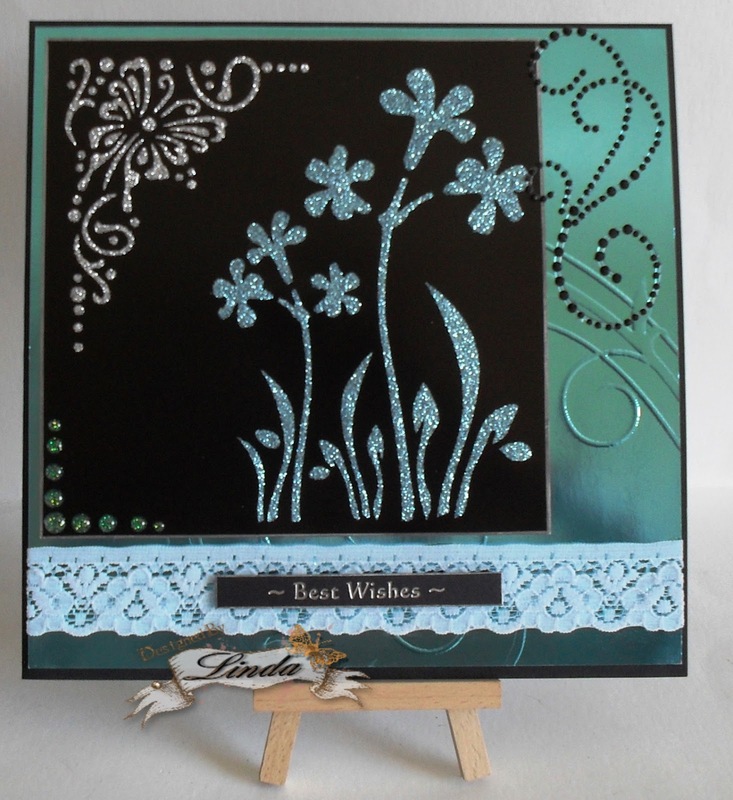 I have masked the stencil onto the black shiny card and used Sparkle Medium in silver to the toper of the card for the butterfly then used Blue Sapphire on the flowers. 3. I have matted and layered the topper onto the card and added glitter gems to one corner. 4. Added a sentiment and black swirl pearls.